Woot is knocking up to $600 off Apple's Mid 2017 13-inch MacBook Pros while supplies last. Now as low as $1,099, these systems are refurbished by Apple with a 90-day Woot warranty. Since Woot is owned by Amazon, Prime members can also snag free shipping on the portable laptops. 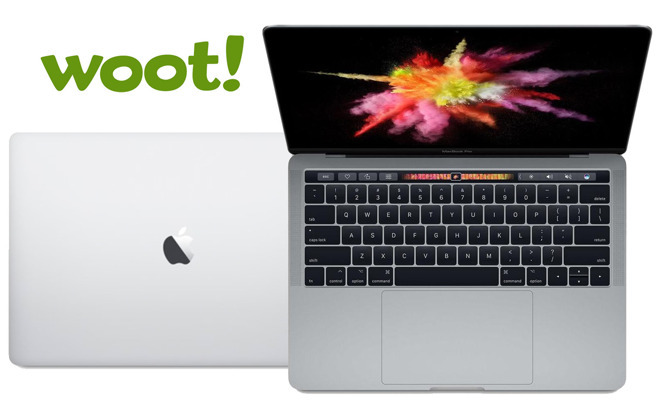 Woot is back at it with one-day only deals on Apple's Mid 2017 13-inch MacBook Pro. Pick up the standard non-Touch Bar model in refurbished condition for just $1,099.99 today only. This represents a $200 discount off original MSRP, making it the lowest price available. And since Woot is an Amazon owned company, shipping is free for Prime members. Refurbished Touch Bar models are also $600 off while supplies last. According to Woot, these MacBooks are refurbished by Apple, but do not come with an Apple warranty. In this case, Woot is providing a 90 Day Woot Warranty. The computers will come packaged in a generic white box. In comparison to new models, it would cost anywhere from $20 to $600 to buy Apple's 2017 13-inch MacBook Pros from other retailers, according to our 2017 13-inch MacBook Pro Price Guide. This deal is valid on Dec. 21 only while supplies last. Woot's Apple deals have been known to sell out early, so don't delay if you want to take advantage of the special offer.